Today, NHL went back to school after two weeks off. This meant that JSL’s entertainment system was gone. Of course, this was made worse by the fact that JSL woke up after Daddy and NHL had left for the day. The reality of time with only Mommy was harsh. Sure we have fun, but I am not his six year old brother who is in constant motion. After breakfast, I asked JSL if he wanted to head out to the post office and grocery store. He liked the idea of going out. Much to my surprise, he was really good about getting help putting on his shoes and coat. Recently, meltdowns are possible at this time because Mr. Independent wants to do everything on his own. Love that he wants to do this, but not when we are late to get NHL from school or on the way out to an appointment. Of course, that should have been a sign to turn around and leave. I did not and we continued into the store. JSL helped me to hold onto the coupons that printed out with my store card. He was content with that. We found some items in produce (new Tempeh to try) and continued on. When we got a few more aisles into the store, JSL wanted out. He kept saying "Let me out! I want to walk." I told him that I needed his help to look for items. It was right about that point that I was ready to sit on the floor with JSL and have a tantrum. 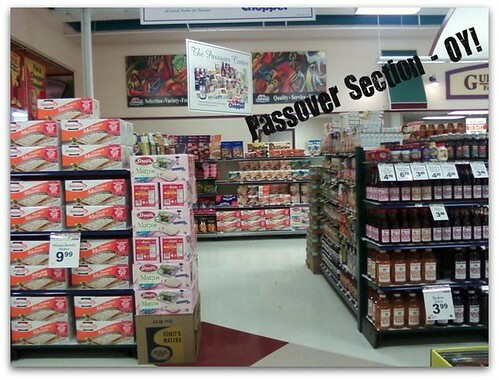 I like the concept of Passover, but the stress involved in the planning and the expense of the specialty foods that are Kosher for Passover makes it too much. Luckily, the rest of the trip was not too eventful. We skipped actually looking in the Passover section, got the rest of the items we needed and went home. JSL was so excited to go and pick big brother up from school a few hours later that he fell asleep a block away from school! Any ideas on how to combat independent toddlers that can not wander around the grocery store? This is something new to me since NHL never did anything like this until he was older. Of course, I know the best solution is to simply shop without him – LOL! I will spare you details about the tantrum in the car later while going home from NHL’s swim lessons. Let’s just say it involved kicking and screaming since The Wiggles were not put on the CD. Beth, I swear you are talking about my life right now. We are in tantrum land here as well. We also have a lot of trouble in the cart at the store. I find that special treats from home and a pen and paper work for a short time, but not very long. Our biggest problem is waiting for anything. I took him to meet some of our friends at Cuck e Cheese today. 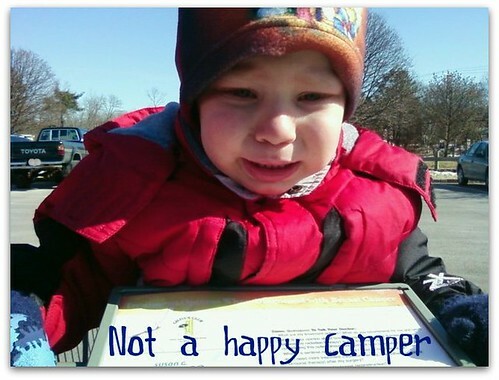 And we had quite a few on the ground crying tantrums because he did not want to wait his turn for rides or games. It gets better, right? Don’t look at it as combat! For me, it’s helped to change my attitude about it. That being said – our plan (once things are “normal” in our house, so… 2012?) is to do a pictoral grocery list. Abby can’t read “Bananas” but she sure could find the picture on the page as we go through the store. For most stuff it’s not too difficult to pull off. It makes having a list more important, but it would give JSL some way to PARTICIPATE in shopping, rather than just being trapped in the cart. Two words: Fruit Snacks. We have them in our pocket and will let things play out for about half of the shopping trip, then pull them out to occupy for the really hard part of the grocery store: checkout. I swear, they need a “parents of young children” line. You can keep the candy and magazines there, I just want two check clerks and two baggers – get me out of there in five minutes instead of ten and you’ve saved me an hour of my mental life! Frankly I let Nati run around in the supermarket. I’ll ask him to get things off the shelf and put them into the cart and he can run on the aisle we’re on but he has to stay in sight. The issue I have is checkout, I I tend to put him back into the double stroller by then but the meltdown isn’t so bad because he’s been running around. .-= Devo K´s last blog ..All the news that’s fit… =-. My first thought was to let him walk. Have him hold onto the grocery cart, and if he runs away, then back into the cart he goes. If you really want to keep him in the cart then snacks are the way to go. A snack cup filled with Cheerios or whatever can keep a toddler occupied for a while. .-= Nancy´s last blog ..February Nightstand =-.